Principal investigator Jorge E. Gonzalez of the Grove School of Engineering. As part of the $2 million grant from the National Science Foundation, The City College of New York and the University of Puerto Rico at Mayagüez will virtually recreate Hurricane Maria and its impact on Puerto Rico. The virtual creation of the hurricane will enable research focusing on the critical infrastructure that left the island and its people without power and water for months. 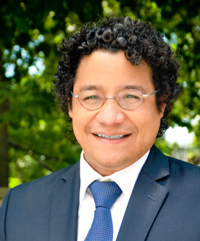 According to principal investigator Jorge E. Gonzalez of the Grove School of Engineering, there is an urgent need for a better understanding of the future risks and expected damage due to extreme climate and catastrophic events that will most likely occur with more frequency and intensity, affecting most coastal tropical regions such as Puerto Rico and the Caribbean. “The research will engage graduate and undergraduate students from CCNY and partner schools providing opportunities for unique training and learning via field data collection, community engagement to reconstruct the events, and in design studios to provide realistic scenarios for a resilient infrastructure and long term recovery of the Island,” said Gonzalez.